The call for submissions for the Eleventh Assistance Dog Blog Carnival is up! This round is being hosted by FridaWrites. The theme she’s chosen is “Resources and Tools.” I like it! I already know what I want to write about. Plus, FridaWrites is offering a couple of nifty dog gear items as a giveaway, inspired by the topic. For the deadline and other pertinent details, check out the call for entries. If you’re new to this and wondering what the heck an Assistance Dog Blog Carnival is, check out the ADBC home page. OK, bloggers, start writing! And the rest of you, will you please help spread the word? Thank you! 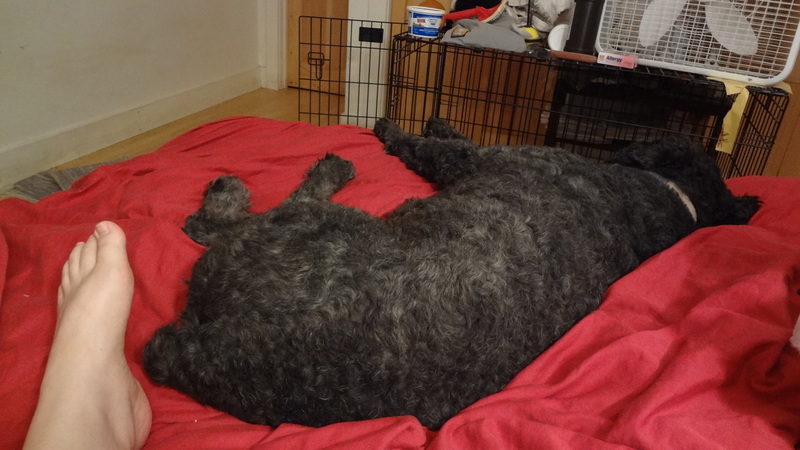 It’s Assistance Dog Blog Carnival time again, and from the moment Martha posted her call for entries, I knew what I wanted to blog about. The problem was that I’d just written that post at the beginning of the month — before I knew that would be the #ADBC theme. What I immediately thought of are the moments that occur now, sporadically but frequently, when I think some version of, “Hey, Barnum is actually acting like a service dog now. He is actually making my life easier.” So, yes, I have written about this before, especially lately, but that’s the thing about these moments — they occur frequently, and each one is a little bit different. Because I have a new camera that’s easier for me to use than my old one — and which can take multiple images in one second, so I can get several pics of Barnum when he’s moving fast — I thought it would be fun to “capture these moments on film.” All the pics in this post were taken within about five minutes tonight. Sometimes these moments are sit-up-and-take-notice moments, when I am surprised to discover that Barnum knows something I didn’t think he did. Usually that’s a moment when I realize, “He actually knows this cue!” For example, now he will turn on or off the hallway light pretty consistently on the single cue, “Light!” Even with my back to him and me moving away from him. This is noteworthy because he has trained and used this cue mostly in my bedroom and bathroom, so this shows that he’s beginning to generalize the idea and he will look up high on walls now when I say, “Light!” To figure out what I might be talking about. When I am done taking pics, I ask him to turn off the light. Similarly, a few days ago Barnum removed my socks when one of my PCAs was here. She smiled and said it was the first time she’d seen him do that. Again, I was surprised. She said she knew he could do it and she’d seen us train it, but she hadn’t seen the whole behavior as a complete working skill before that. 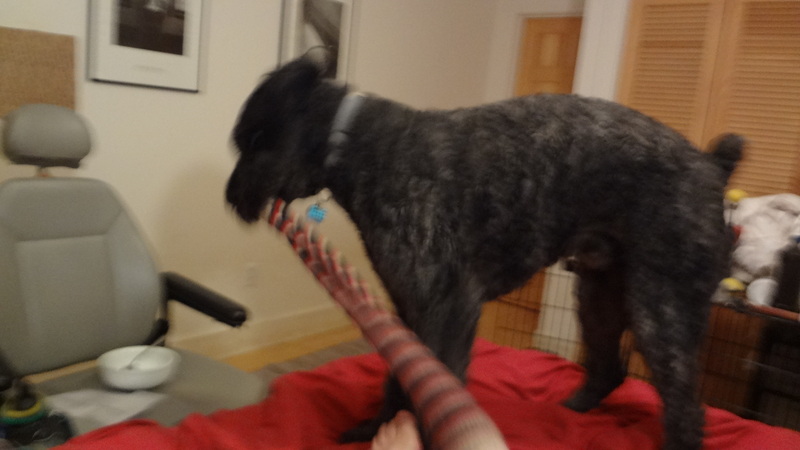 I tried to capture the sock removal process on film, but Barnum was so quick, I couldn’t keep him in the frame to take pictures fast enough. Beginning with the left foot…. 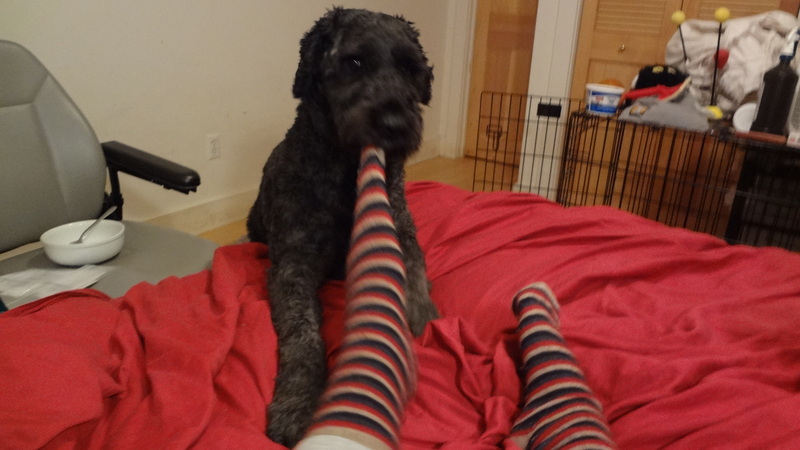 Speaking of socks, another moment is when I realize Barnum is more helpful (easier, faster, more pleasant, whatever) with a task than a human would be. (Please note, humans reading this who sometimes assist me, that this is not any sort of slight against you.) When Barnum takes off my socks, he grabs the toe and pulls until it’s off and then hands it to me; it’s pretty fast and painless. 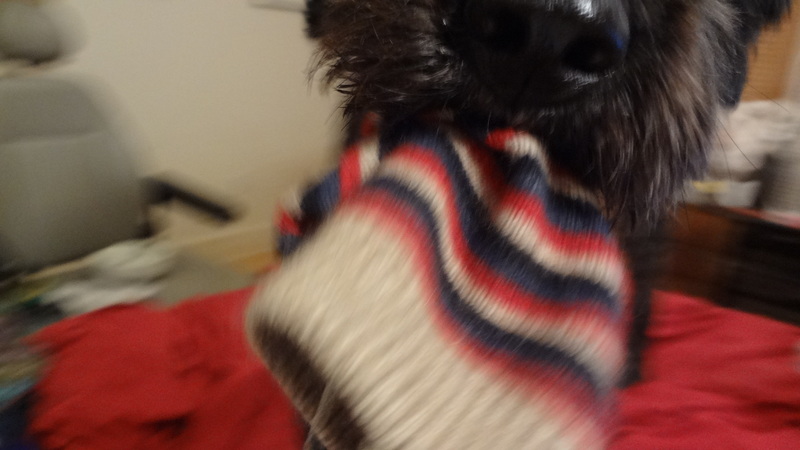 People, on the other hand, often make quite a meal of sock removal because they are trying to be careful and gentle. I’m in pain a lot, so they are worried about hurting me. I have big, sweaty feet, so removing my socks can be quite a chore, as it’s hard to find socks big enough. 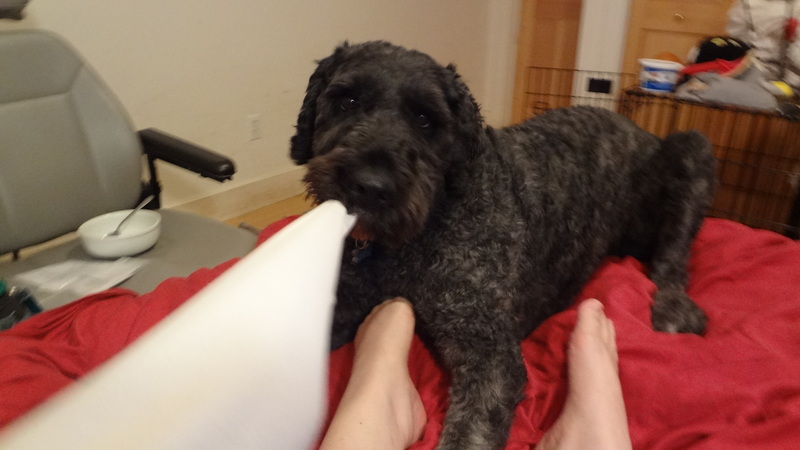 Human assistants often try to loosen the sock, roll it down from the top, ease over my ankle or heel, tug here and there — all out of a desire to be gentle and caring. Unfortunately the process takes too long, which causes me more pain and exhaustion than I want to deal with. Barnum is not thinking about my pain or exhaustion. 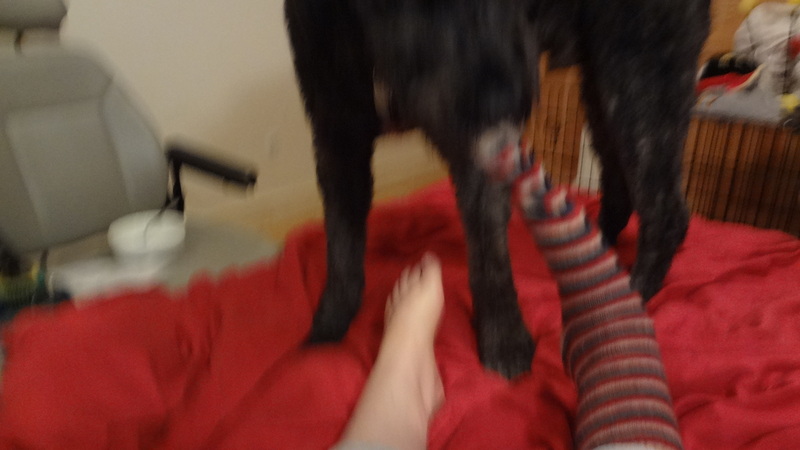 To him, sock removal is a fun game that might earn him a treat, so it goes fast! Likewise, I’ve started having Barnum help me off with my long-sleeved tops (something I do several times a day due to fluctuations in temperature and to get to my PICC line). It’s like a sock — for your arm! I didn’t used to ask him to do this because I thought calling him, getting him in position, and polishing the skill would be more trouble than it’s worth. But I realized last night that actually he can do it quickly and easily, making it less painful than doing it myself or with human help. I focus my training on the skills I need when I can’t do them alone. When no human assistant is here. When I’d be stuck without Barnum’s assistance. It often seems like overtraining and sometimes I question that choice — until one of those days happen when I really do need that help. But more often I find that I ask him to perform a skill just because he enjoys it, I enjoy it, and it’s easier and more fun than relying on a person. And sometimes because he actually does a better job. Often it just comes down to attitude or communication. It’s not that people in my life have “an attitude” about helping me, but if Barnum’s in my room, and my PCA is in another part of the house, it’s just more enjoyable and less emotionally tiring to have Barnum help me, which he finds thrilling, than to — for example — pull my PCA away from making my food or doing my laundry — to come over and do something as simple as shut a door or turn off a light or pull down my covers. It took me a long time to get down to writing this post, and then it just flowed out of me, and I think the reason for both the procrastination and the ease is that the moments happen so often now, they are easy to miss. So, on one hand, it’s taken me a while to pick out what to write about, to remember, “What were our recent ‘moments’?” On the other hand, there are so many that once I call them forth I could write an endless post about this moment, then this moment, then this one. But I don’t want to do that to you, readers. I might put you to sleep! Besides, there are a lot of posts to read in this blog carnival, and I know you will want to get them all. I only wanted you to stop here for a moment. P.S. Guess who’s hosting the next #ADBC? Get ready! Assistance Dog Blog Carnival #6 Seeking Entries! The host for this edition is Cait at Dogstar Academy. The theme she’s chosen is “Obstacles,” and she has some nifty thoughts to ponder on the topic. There should be no obstacles to a great carnival! Check out her call for submissions! And please share, tweet, and generally spread the word about this carnival so that anyone who might like to participate has time. For those who are planning on posting, may you find no obstacles in your path. We're achieving another great carnival! The theme for the fifth Assistance Dog Blog Carnival is “Achievement.” Barnum and I had two very exciting outings recently — one caught on video — which I’m very excited to share with you. It’s perfect timing for the carnival. The achievements that Barnum and I celebrate are not the successes of a graduation or a title. Rather, they are small steps that are leading us — oh, so slowly, it often seems — along the path to a working partnership. I don’t think we have a single behavior that I can say is truly finished — not just service skills, but basic obedience and manners, too. Working on so many little skills day after day, it becomes hard to observe that any improvement is taking place. That’s why a day like last week — or last month when we first went into a store — is such a big deal: the improvements are a stark contrast to previous efforts, clear enough for me to notice and revel in them. This past Thursday I had my biannual appointment with my primary care doctor. The appointment itself was completely useless. (More about that another time.) However, I brought Barnum with me — even though he couldn’t come inside — with hopes that we’d do some training in the parking lot after my appointment. My driver and assistant took care of him during the appointment. Click here to read a transcript of the video. Click here to watch the video with captions. Anynoodle, there is still much that can be done in parking lots or on sidewalks or at the locales that are SDiT-team friendly. Thus, after my appointment, I dressed Barnum in his snazzy working gear. We had a couple of “oopses.” One, which has never happened before, and which I hope never happens again, is that Barnum jumped the gun on exiting the van. He has gotten pretty good at staying inside until he is cued to exit. For whatever reason, though, today he jumped out while leashless. This was scary because we were in “the city” (for my area), and there was actual traffic beyond the parking lot. However, my helper snagged him, I walked him back to the van, and he jumped back in. Disaster averted. First note of something to work on more! Then, we did some automatic sits before exiting (which is what he should have done instead of just hopping out previously), and I cued him to jump out and sit, which he did. I was pleased he was so focused on me and that I got such a fast and snappy sit. I had him sit-stay while I moved around, and then we were off. Focus. Barnum kept focus on me and loads of eye contact the whole time. That is the foundation for everything else. I was thrilled by it. Happiness. Barnum’s tail was up and wagging. His step was springy. He showed no signs of fear or vigilance (except one startle issue, which I’ll get to shortly). He was totally in the game and enjoying himself. At one point, I said, “Back up,” and instead of just walking backward, he leaped backward. He does the bouvie-bounce/pounce/spring thing when he’s loving training. Loose leash. I didn’t even realize until we were on the way home that Barnum never pulled on the leash except at the end, when another dog was right nearby, whining at us. Positional cues. I asked for sits, downs, nose touches, chin targets, backing up, standing up, coming to my side, and Barnum was about 90 percent reliable on all cues. Toileting. When we were first heading from the parking lot to the sidewalk, I could tell that Barnum wanted to go sniff and mark the lawn, bushes, and flowers we were approaching. However, I kept him busy and focused on me, and he either realized that marking and sniffing was not acceptable, or he was too focused on working to care. When we were finished training, I took off his pack and harness and brought him to the grass and cued him to pee. He offered a short squirt, which I was very pleased about. It indicated to me that he probably did know the cue (as soon as I said, “Hurry up,” he started looking around the grass, circling, and sniffing) and that he was doing his best to follow it, even though he didn’t need to go. It’s possible that he was just marking, now that he had the opportunity, but I’m okay with that as a stepping stone to a more solid elimination on cue. This is the first time he has eliminated on cue in a totally new environment! Transferring new cues from home – Part I: Door Opener. These were the ones that really thrilled me. Barnum has never touched a door opener before. The door opener for the external door at my doctor’s office is a silver vertical rectangle — not at all the shape I thought I’d remembered! At home, we’d been practicing the moves that would apply to a door opener — the same ones as for turning on or off a light switch — but my faux door-opener was a big blue paper square! The real door button was about three feet high and placed on the pane between the glass door and window. I held my hand over the button and had him nose-target my hand a few times. He could reach it without jumping up, but only just. He had to stretch his nose all the way up. . . .
Then I pointed at the button and told Barnum, “Touch!” He just barely bumped the bottom of the button, but that was enough; the door immediately swung outward. Barnum jumped back in surprise. I gave him extra treats and praise, along with the initial click/treat, and we did that a few more times. He hit the button every time, and he was surprised by the door every time, but with successively decreased concern. I think we’ll have to practice this many times before he is totally comfortable with the door swinging open. It’s the one area he has always had anxiety — doors swinging toward him from the front or the rear. (When he was temperament tested at seven weeks old, a solid object moving suddenly toward him was the only part of the test that scored poorly on; everything else was perfect or near-perfect, and those results were surprisingly predictive of his future behaviors and tendencies.) 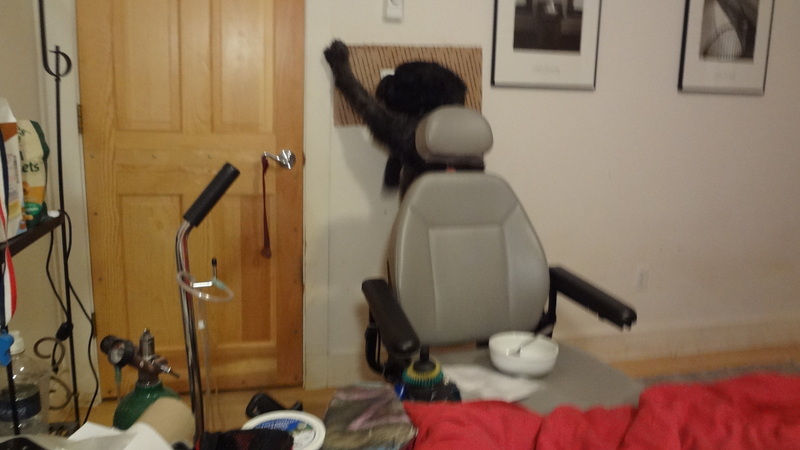 So, the fact that he continued to press the door opener and did not wig out — in this completely new environment, to boot — seemed like a good sign to me. Transferring new cues from home – Part II: The Retrieve. We have not yet achieved a complete trained retrieve at home. Barnum will take something from my hand, hold it quietly for a pretty long time, and then — on my cue — will drop it. But he hasn’t figured out that picking things up off the floor can be handled the same way as taking things from me. So, our big effort has gone into the take/hold part of the retrieve. 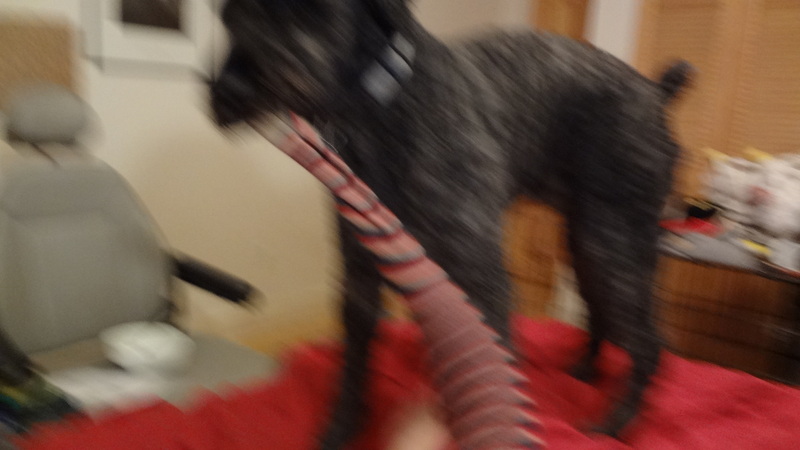 It had not even occurred to me to try this skill away from home yet. . . .
Then, something happened — I can’t remember what anymore — where I was holding something out, and he went to take it in his mouth! I had not been looking for that, but I was able to click and treat it. “Why not?” Says I to myself. So, I held out a pen — the object he’s the most eager and comfortable taking and holding — and we did a few repetitions of that. Well, knock me over with a feather! Unfortunately, this woman wanted to chat me up about my “service dog.” I had to correct her that we were in training, because Barnum was not comporting himself as a trained SD should, and I don’t like to spread any more misinformation about SDs than already exists. Then, she wanted to tell me about how her dog, the one she is leaving in the car who is wearing no gear, is a service dog, too, and perfectly eager for our dogs to interact! Usually if I say, “We’re training,” in a very “read-between-the-lines-please” voice, people back off a bit, but not this woman. Trying to focus on getting Barnum refocused and loaded into the van while not getting downright rude to this stranger meant that I lost control of the situation, and Barnum decided that, yes, it would be acceptable to pull like a freight train to get to the boxer, who had started to whine. Somehow, finally, I managed to ignore the other person enough to get Barnum loaded, and then he settled down. On the way home, we did lots more practice with taking and holding objects, and various simple skills, and I was just over the moon. P.S. If you’d like to learn more about the ADBC, read past issues, check out the schedule for the next few carnivals, or learn how to get involved, please visit this page about the Assistance Dog Blog Carnival. P.P.S. You know what was really an achievement? Completing this post! I had so much difficulty creating and uploading that video — it took a week! — and then when I finally did get it uploaded, I discovered I had left out a segment in the middle and had to create and upload a new version! All future videos will be much shorter!